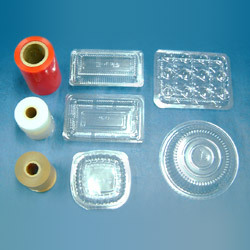 printing, plating, lamination and stability. 2 Application: applied in stationery adornment, and commodities' packaging material, building material for decoration, cooling water tower, filling material and waste water processing panel, cards, album, folding handmade box, battery packing and paillette. 1. Thickness 0.045m/m ~ 1.00m/m. 2. Width: 50cm ~ 130cm. 3. Embossed: glossy / matte. 4. Color: transparency, pure white, black, other colors. 5. Mini. Order transparency / 1500kgs, other colors / 3000kgs.